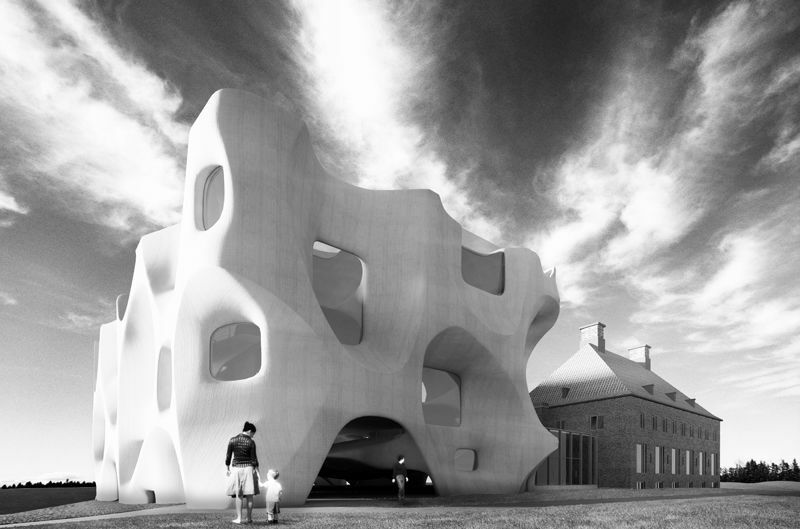 Can the experience of art be enhanced through architecture? White walls + Isolated Rooms = Good museum? 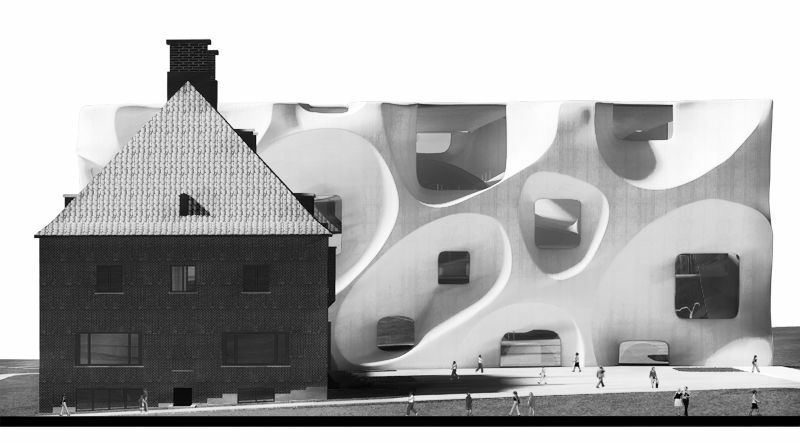 In collaboration with Eero Lunden Architects, our design of the Serlauchius Museum extension seeks to deviate from that mantra by developing an architecture that directly facilitates human interaction with art. It is our firm belief that the experience of art can be enhanced through innovative architecture and new spatial experiences.The design of the Serlachius Museum seeks to achieve two main goals: to create an inspiring piece of architecture that will enhance the image of Serlachius Art Musuem globally and to provide a truly unique museum experience by connecting visitors with the art like never before. 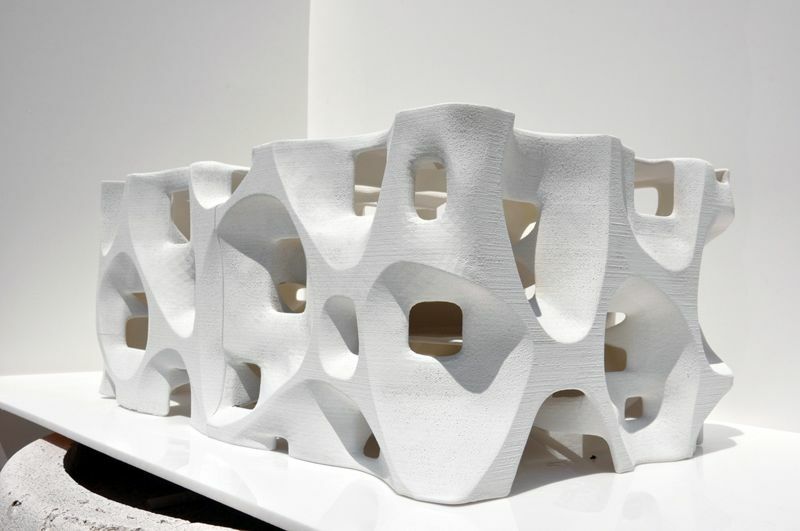 It is our belief that structural innovation leads to spatial innovation. Corbusier, Koolhaas, Ito, Sejima, the great architects of past and present, their new spatial typologies were only made possible through a re-imagination of structure. Corb = Maison Domino and the column grid, Ito = Sendai Mediateque and its use of the occupiable structure, etc. 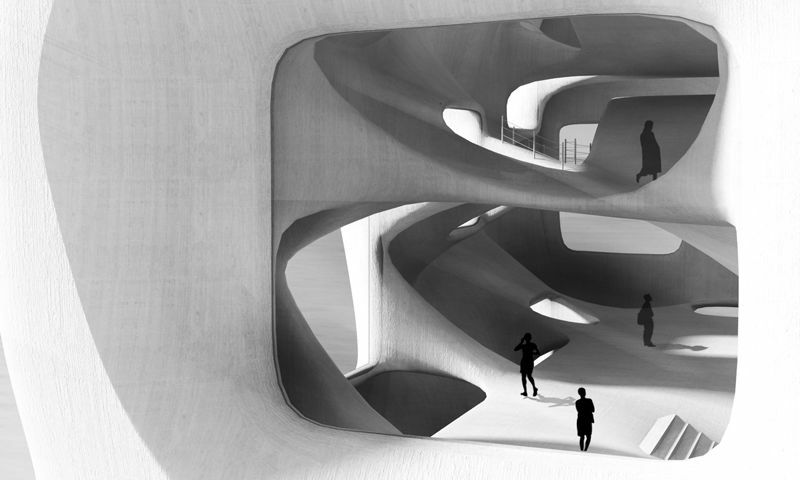 Structural invention lead to new kinds of architecture and new kinds of spaces. Utilizing this entry as a test bed of structural experimentation, we intend to build upon their work. Different structural designs drastically affects how the building envelope is designed. Our design is to use the building envelope as the structure. By using the building envelope as the structure, the plan is completely free of columns and obstructions. The lack of columns allows the floor slab (and subsequently floor plans) to potentially take any shape. 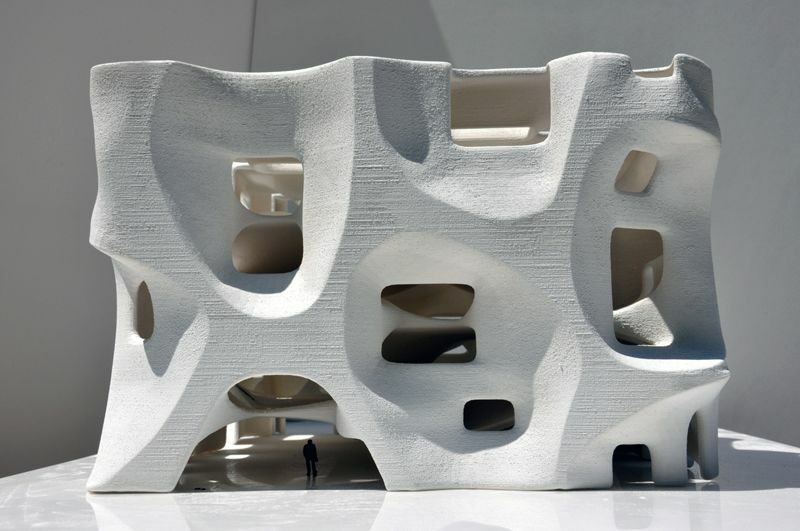 How does a building with a floor slab that can take any shape look like and perform? Our concept is to exploit the Truly Free Plan to create new spatial experiences and architectural innovation! 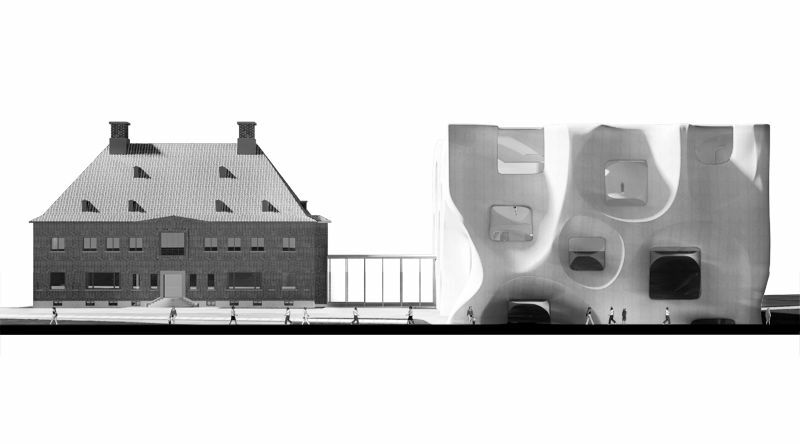 Retaining the concept of the art museum as a seamless space for visitors, the design contains as minimal obstructions as possible. 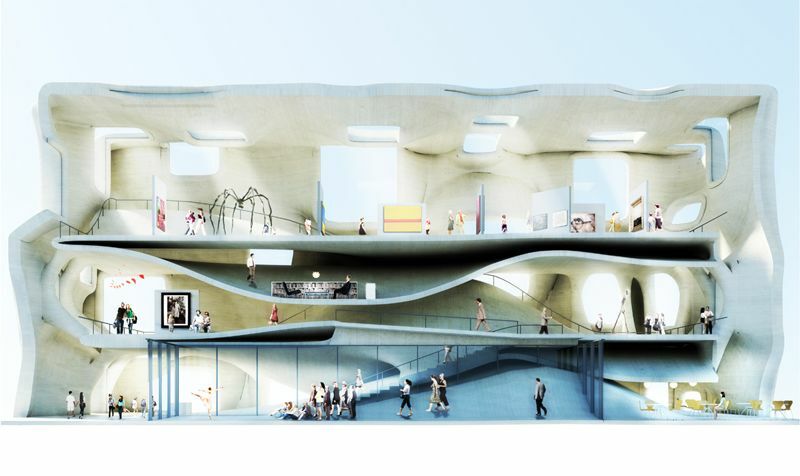 This is achieved by connecting the various different functions of the museum through the use of an innovative structural system. Instead of utilizing a typical grid of columns, the structure is moved into the façade of the building in order to achieve an atmosphere of total continuity. All the main public functions form continuous uninterrupted spaces on each floor while the supportive functions (kitchen, toilets, storage, etc.) have been pushed between the slabs in order to offer an experience of architecture that is totally devoted to experiencing art and culture. To experience art in a completely new way the exhibition spaces have been designed to create a new kind of dialogue between the art and the visitor. The sloped floor areas that surround the flat exhibition areas invite visitors to stop and lay down to experience the art with time and commitment. 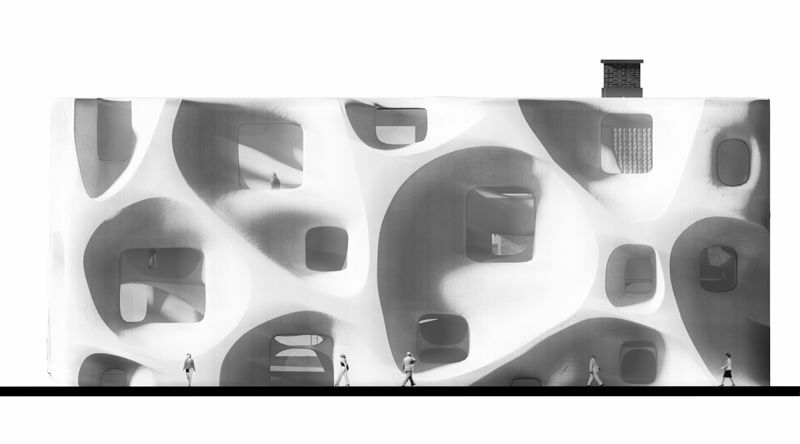 Instead of a rigid spatial sequence that forces visitors to rush from a gallery to another. The overall spatial concept encourages people to establish their own pace and choreography for their own unique museum experience. 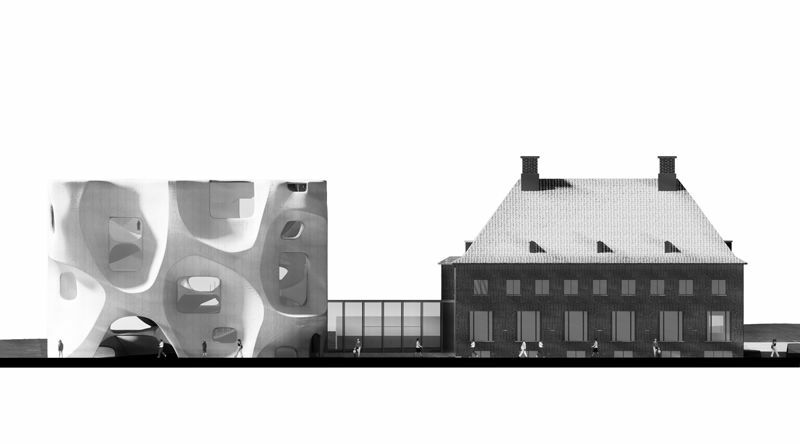 The design of the new extension is a 4,700 m2 extension composed of 4 floors and a basement. It is strategically positioned adjacent to the Serlachius Museum. This location allows for the architecture to emphasize the character of the existing institution while preserving much of the surrounding nature. A simple connecting entrance is formed in the space between the existing and the new building allowing for easy access between the two buildings. 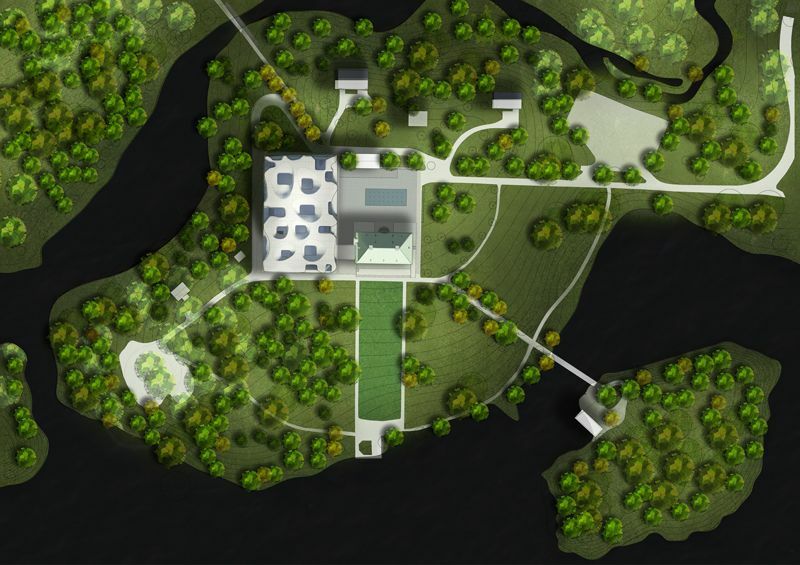 The new building will be the center of focus when arriving to the new Museum Courtyard while the old Mansion still maintains its position as a dominant in the landscape.